See also: Dismal Swamp Canal. The Intracoastal waterway, a federally protected and maintained shipping route, extends along the Atlantic seaboard from the St. John's River near Jacksonville, Fla., to Norfolk, Va., and the entrance to the Chesapeake Bay. More broadly defined, the term "intracoastal waterway" is often applied as well to the less-sheltered passages connecting northward to Boston and southward to Key West. An initial impetus behind the waterway's construction was the need for coastal shipping to avoid the treacherous waters off North Carolina's shores, particularly Cape Hatteras. The waterway enters the state from Virginia by way of two alternative routes-the less-traveled passage through the Dismal Swamp Canal and the more popular Virginia Cut to the east. The waterway's southern exit from the state occurs at Little River Inlet near Calabash. Between these two points, the waterway meanders through more than 300 miles of sounds, rivers, creeks, marshes, and manmade cuts. Two early surveys of projected waterway routes through North Carolina were undertaken in 1837 and 1875, but systematic construction began only after passage of the federal Rivers and Harbors Act of 1912. Subsequently, major portions of the project were completed during the 1910s and 1920s. The last North Carolina section to be built, extending from the Cape Fear River to the South Carolina line, opened to traffic in 1934. Once completed, the North Carolina portion of the waterway came under heavy usage by motor vessels, barges, and tugs, with commercial tonnage consisting primarily of seafood, fertilizers, agricultural commodities, petroleum products, and general merchandise. Also making use of the waterway from the time of its completion were yachts and various other pleasure craft. During World War II, the waterway provided a means of transporting vital cargoes through North Carolina waters while avoiding the menace of German submarines offshore. The North Carolina section of the Atlantic Intracoastal Waterway remains a significant artery of commerce for the movement of heavy, bulky cargoes such as timber, pulpwood, and crushed stone. Although it is still important to commercial and sport fishermen, its use is increasingly associated with pleasure craft. Especially in the spring and fall, the waterway provides a protected passage for traveling mariners en route to second homes or those in pursuit of adventure, natural beauty, and the society of kindred spirits. Largely in response to such boaters' presence and relative affluence, communities along the waterway such as Elizabeth City, Belhaven, Oriental, Beaufort, Wrightsville Beach, and Southport have become tourist centers and ports of call. Allan C. Fisher Jr., America's Inland Waterway: Exploring the Atlantic Seaboard (1973). Ronald B. Hartzer, To Great and Useful Purpose: A History of the Wilmington District U.S. Army Corps of Engineers (1984). Bob Simpson and Mary Simpson, "The Big Ditch," Wildlife in North Carolina (May 1988). Claiborne S. Young, Cruising Guide to Coastal North Carolina (1994). "Intracoastal Waterway." Encyclopædia Britannica. Encyclopædia Britannica Online Academic Edition. 2013. http://www.britannica.com/EBchecked/topic/291932/Intracoastal-Waterway (accessed March 18, 2013). Parkman, Aubrey. History of the Waterways of the Atlantic Coast of the United States. National Waterways Study, U.S. Army Engineer Water Resources Support Center, Institute for Water Resources. January 1983. (accessed March 18, 2013). "Atlantic Intracoastal Waterway." U.S. Army Corps of Engineers. http://www.nao.usace.army.mil/Missions/CivilWorks/AIWW.aspx (accessed March 18, 2013). 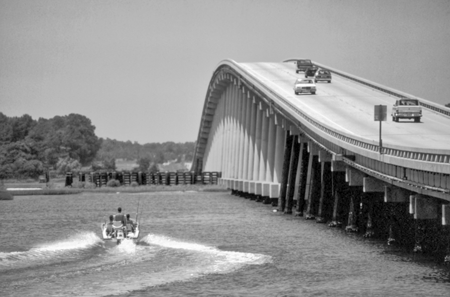 Cameron Langston Bridge over the Intracoastal Waterway on N.C. 58, connecting Cape Carteret and Emerald Isle. Photograph by Charles E. Jones. North Carolina Department of Transportation. To use for 4th grade group presentation in class.